Description: Number 1 has the freight train on the old Illinois Terminal main. Description: 0-4-0T #1 of the Monticello and Sangamon Valley museum prepares to move forward on a hot July 22, 1984. I don't remember if the steam was from the whistle or if the steam was escaping from the safety valve. Description: This photo shows MRYM #1, an 0-4-0T as it seens to be taking on some water for today's excursion train on 7-22-1984 at Monticello, IL. I don't know if the steam was from the whistle or if it was escaping from the safety valve. Description: M&SV (Monticello and Sangamon Valley) 0-4-0T, #1, has now run around the cars and is preparing to take today's excursion train out on the run on July 22, 1984 at Monticello, IL. 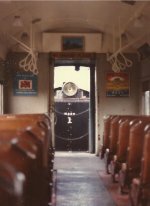 The passenger car is a former Rock Island Chicago-area commuter car, IINM. 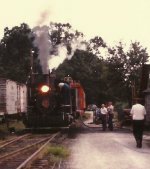 Description: This photo of Monticello Railway Museum #1, an 0-4-0 steam engine, comes from a scanned postcard we bought on 7-22-1984. 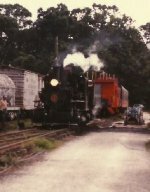 #1 is pulling a tender, instead of wearing the "saddle tank" seen in other photos. Description: Monticlleo Railway Museum #1, an 0-4-0 steam engine, pulls another locomotive on the Museum trackage at an unknown date. This is a scan of a postcard we bought on 7-22-1984. The date when #1 had the "saddle tank" reinstalled, or taken off for this season, is unknown. Description: 0-4-0 Alco switcher built in 1930. This locomotive now sits at the entrance of the Monticello Railway Museum. Description: This view looks north-northwest. #1 has a door to the cab and red trim for the window frames. Lettering is white. This engine is parked on display near the entrance to the Monticello and Sangamon Valley tourist line and the Monticello Railway Museum. I've been there a couple of times and would LOVE to go back! Description: MRYM #1 used to haul excursion trains on the Monticello and Sangamon Valley Railroad but it now serves as a display near the entrance to the museum. This view looks nearly due west and the sun provided some interesting effects (!) on this photo.